When a buyer buys a housing property and find defects that he or she could not know in advance, the seller of the house is liable for the defects. This is called “warranty against defects,” which is provided in the following and other laws. With regard to the warranty against defects of the seller in a transaction, the Civil Code stipulates that the buyer can cancel the contract or claim for damages (provided, however, that the contract is cancelled only when the purpose of the transaction is not fulfilled because of the defects). Furthermore, the Civil Code depicts that the seller shall assume warranty against defects for the period of one year from the date when the buyer finds the existence of latent defects. Due to the regulations under the Building Lots and Buildings Transaction Business Act, building lots and buildings transaction business operators shall assume warranty against defects for at least two years for the contracts in which they themselves serve as the seller. ​These provisions are applicable prior to the provisions of the Civil Code. Accordingly, contract articles that contravene these restrictions shall become invalid. The Housing Quality Assurance Act is a law enacted for the purpose of promoting quality assurance of housing, protecting interests of homebuyers, and resolving disputes over housing in a prompt and proper manner, etc. Specifically, the law obliges the sellers, etc. 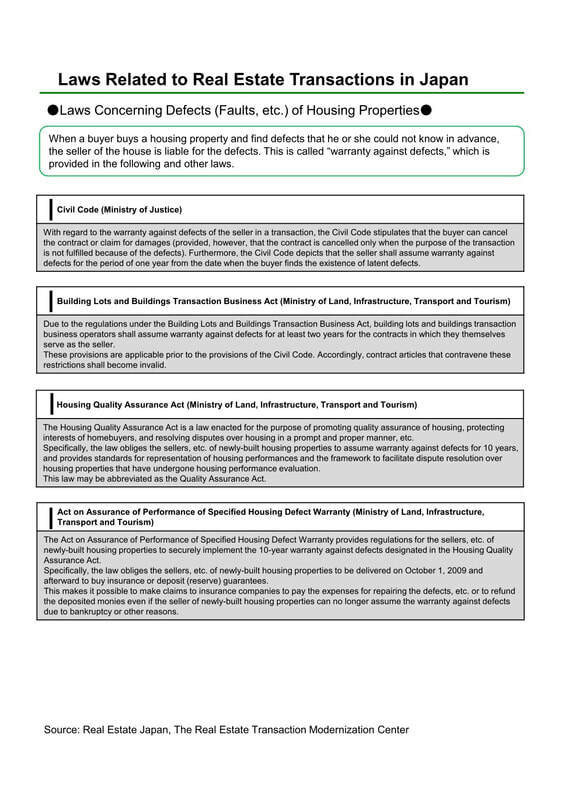 of newly-built housing properties to assume warranty against defects for 10 years, and provides standards for representation of housing performances and the framework to facilitate dispute resolution over housing properties that have undergone housing performance evaluation. ​This law may be abbreviated as the Quality Assurance Act. The Act on Assurance of Performance of Specified Housing Defect Warranty provides regulations for the sellers, etc. of newly-built housing properties to securely implement the 10-year warranty against defects designated in the Housing Quality Assurance Act. Specifically, the law obliges the sellers, etc. of newly-built housing properties to be delivered on October 1, 2009 and afterward to buy insurance or deposit (reserve) guarantees. ​This makes it possible to make claims to insurance companies to pay the expenses for repairing the defects, etc. or to refund the deposited monies even if the seller of newly-built housing properties can no longer assume the warranty against defects due to bankruptcy or other reasons.